PSG beat Barcelona at its own game, while Barcelona's up-and-coming players failed to meet the standards of their predecessors in a stunning Champions League result in Paris. Not since 2007 has Barcelona failed to reach the quarterfinal of the Champions League, but it is in serious danger of missing out this season after being comprehensively beaten 4-0 by Paris Saint-Germain in the first leg of their round-of-16 showdown on Tuesday. The French champions appointed Unai Emery as coach for his European record, and, after a season that began awkwardly defensively, he responded by delivering probably the most eye-catching result the club has achieved in the Champions League. Angel Di Maria scored twice and Julian Draxler and Edinson Cavani got the others as Barcelona matched its worst-ever European result. In the night’s other last-16 first leg, Benfica rode its luck to beat Borussia Dortmund 1-0, with Kostas Mitroglou getting the goal before Pierre-Emerick Aubameyang missed a penalty. It used to be that Barcelona would press opponents into submission, suffocating them with the intensity of their closing speed and repetition, but not any more. Manchester City showed the way in November, pressing with great ferocity, forcing Barcelona into mistakes and winning 3-1 in the Champions League group stage. Unai Emery had troubled Barcelona in his time as Sevilla coach (although he had beaten Luis Enrique’s side only once in six meetings–and in total held beaten Barcelona only once in 23 games as a coach), and he followed that template, taking Barcelona on at the game at which it had once excelled. Right from the opening whistle PSG was aggressive, pushing Barça back. At one point Marc-Andre ter Stegen was pressured in his own six-yard box and sliced a clearance into touch. 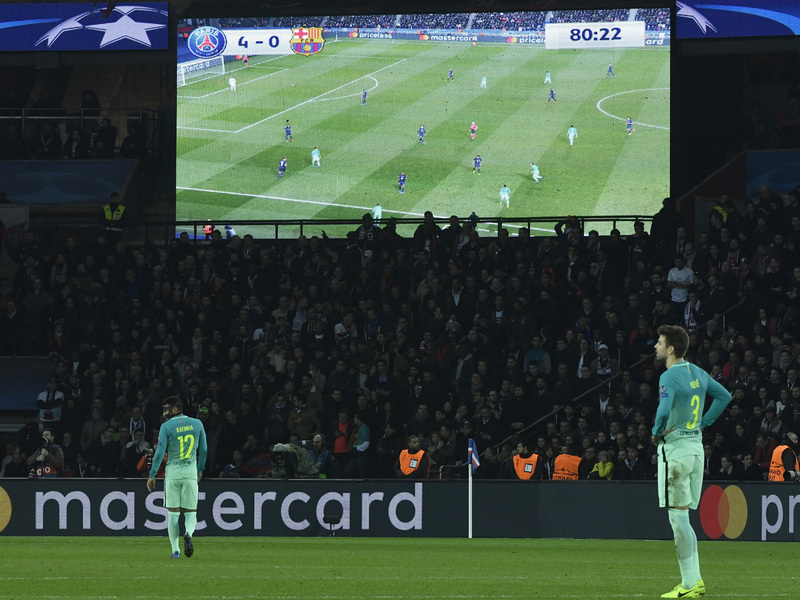 A little later, Barça was forced to play the ball back to the goalkeeper from a corner, bringing greater cheers from an appreciative Parisian crowd. The ferocity was remarkable, and it worked. Barca’s passing was unusually sloppy as, with Marco Verratti and Angel Di Maria at the heart of everything, the chances racked up for PSG. Ter Stegen was called into early saves from Edinson Cavani and then, spectacularly, from Blaise Matuidi. PSG’s reward for its start came after 18 minutes as Di Maria, on his 29th birthday, whipped a free kick up and over the wall and in at Ter Stegen’s left-hand post. Barcelona’s problem is that if the midfield finds itself under pressure, this forward line, prodigiously gifted as it is, doesn’t do a huge amount of work to get the ball back. That’s the big difference between Luis Enrique’s Barça and Pep Guardiola’s. The upside is that that this front line is probably more penetrative, more capable of creating openings with individual skill, less likely to get bogged down than Guardiola’s old squad; the down side is it can look as disjointed as it did in Paris. Six minutes before halftime, PSG had a second, and again it came from its pressing. Adrien Rabiot robbed Lionel Messi, Draxler exchanged passes with Veratti and hammered his first Champions League goal for the club past Ter Stegen. Halftime brought no let-up. Di Maria got his second and PSG’s third 11 minutes into the second half sweeping the ball into the top corner after a move that ran the length of the pitch. Again, though, ruthless as PSG was, Barça was weirdly diffident, sitting off, almost inviting Di Maria to shoot. Di Maria and Verratti both were substituted off, but the assault continued as Barcelona utterly lost its discipline. The last half hour of the game consisted almost entirely of Barcelona losing the ball and then PSG surging forward into space on the counter. It was just such a move that brought the fourth, right back Thomas Meunier surging forward and playing in Cavani, who marked his 30th birthday with the final blow. Samuel Umtiti headed against the post from close-range late on but there was to be no away goal to give Barça even a sliver of hope going into next month's second leg. The great Barcelona era is coming to an end, and the new generation is struggling to live up to past glories. There are problems all over the pitch, but most notably in midfield. Sergio Busquets, such a vital figure in recent seasons, the spider at the center of the web, had one of his increasingly frequent poor games, while Andre Gomes never got to grips with the pace of the game. Right back Sergi Roberto, meanwhile, was isolated again and again. Replacing Dani Alves is one of those impossible jobs, and it may be that Aleix Vidal, had it not been for a series of injuries culminating in the broken ankle that will keep him out for the rest of the season, would have emerged as the preferred choice. The task of preparing for game of this magnitude is made all the harder because of how rarely Barcelona’s right back has to defend over the normal course of a season. Sergi Roberto has had a reasonable season, but he was badly exposed here, not helped by a lack of support from his midfield, as Draxler and Di Maria went past him almost at will. But this was a general collapse as Barça was outfought, outrun, outbattled and outplayed. For large portions of the game at its home stadium, Benfica was outplayed. Dortmund had chance after chance but, as so often as has happened in the Bundesliga this season, it lacked the edge to makes its superiority count. Aubameyang fired over when clean through early on, Ousmane Dembele had an effort blocked from a Marco Reus cutback and then, six minutes before the break, Ousmane Dembele nipped in front of Ederson only to be taken out by a clumsy swipe from the boot of the goalkeeper. Mystifyingly, no free kick was given: it was probably just outside the box, but given the dangerousness of the position and the force of the challenge, it was at the very least a yellow-card offense and possible worse. But four minutes after halftime, it was Benfica who took the lead, with Mitroglou poking in after Dortmund made a mess of clearing a corner. Still the chances came, most notably just before the hour as Aubameyang’s tame penalty, awarded for a handball by Ljubomir Fejsa, was saved by Ederson. There's work to be done in the second leg in Germany on March 8.